Carrier vibrating fluid bed coolers are designed to cool a variety of products at a wide variation of feed rates. Vibrating fluid bed coolers function by passing process air directly through a bed of solids via a perforated plate or another type of fluidizing media. Vibration is added to aid in fluidization of more difficult to fluidize materials. Material that has a wide particle size distribution — vibration will help to discharge oversize particles that will not fluidize. Fragile materials — low amplitude fluid bed cooler vibration and reduced fluidizing velocity create a gentle bed, which causes less degradation than conventional fluid bed coolers or other mechanical coolers. Material is continuously mixed while cooling — homogeneous with no hot spots! Lower fluidizing velocities are required, making the fluid bed cooler system more thermally efficient. 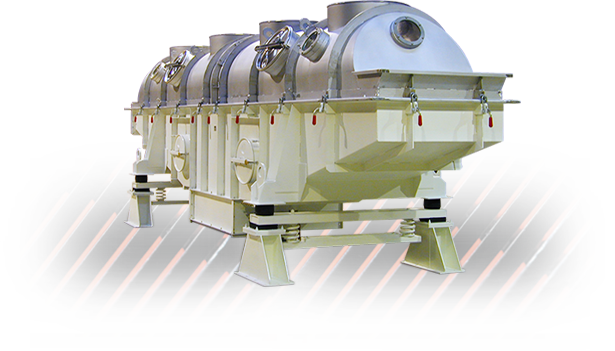 Re-circulated gas and closed-loop fluid bed cooler systems available for inert atmosphere or solvent recovery. 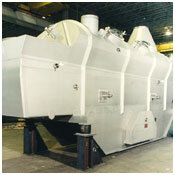 Clean-in-place and fire suppression fluid bed cooler systems available where necessary. Sanitary, U.S.D.A. (3A) approved construction. For more information on Fluid Bed Coolers, refer to brochure #16510.